Home > Blog > boating > How Do I Clean My Boat? Your new beautiful boat sparkles in the sun the first few months. As time goes on, residue and minerals build up and the sun begins to fade surfaces. Proper care and cleaning of your boat’s exterior is not quite as important as keeping your boat engine running in top shape but a clean boat, free of build up and spots looks great out on the water. There are hundreds of products out there to clean, maintain and wax your boat. With all those products, it becomes a bit overwhelming to know which you need to get your boat sparkling clean. 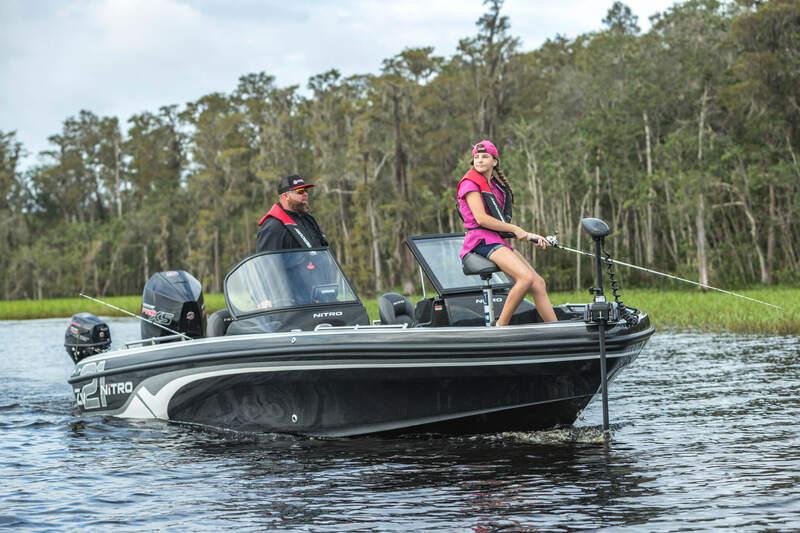 This article list 6 steps to cleaning your boat and gives a few product recommendations. Rinse – Cleaning a boat is a bit similar to cleaning a car. First you should thoroughly rinse your boat to get off debris and dust. Start at the top and rinse to the bottom. The use of a power washer if available can be very helpful especially under the water line. 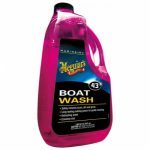 Soap – Next you will wash the outside of your boat with a marine grade boat wash such as Meguiar’s Boat Wash. Do not use dish soap as it can strip wax and phosphates are not good for the environment of the lake. Use a soft bristle brush on a handle for hard to reach places. Be sure your brush is soft enough that it does not scratch your surfaces. Below the water line you can use a firm bristle brush to remove algee and buildup. If you have remaining stains such as fish blood, scum or rust, find the most gentle product you can use to get the stain out. Most of these cleaners are acid based and can damage delicate parts of your boat. Rinse Again – Rinse your boat as you go. Washing and rinsing in small sections is ideal as you do not want the soap to dry on your boat. Drying soap on your boat dulls the surface and leaves you with a lot of work to get the shine back. Dry/Buff – Dry with a shammy and buff your exterior. A rotary buffer will really bring out the shine. 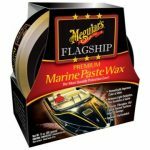 Wax – If you decide to wax, use ma rine grade boat wax such as Meguire’s Flagship Premium Marine Wax Paste. Work in small areas, removing and buffing wax as you go. Your boat will sparkle like new. Interior – clean your interior with a gentle all purpose marine cleaner like Meguire’s Extreme Marine Multi-Purpose Cleaner with a soft clean cloth. A very soft bristle brush can be used on stubborn spots on vinyl or glass.Now that your boat is sparkly clean, sit back and enjoy the rest of your day on the lake with family and friends.